The palm trees swayed slowly from side to side, gently rocked by the same summer breeze that rippled the crystal clear Caribbean waters. We placed our bags at our feet and relaxed next to the immaculately clean pool. A smiling waiter placed two complimentary drinks beside us and said, “Welcome to Victoria House”. This is the kind of warm welcome you can expect when visiting Victoria House Resort on Ambergris Caye in Belize. But the relaxation had just begun. As we sipped our delicious rum punch and gazed out at the sea, we realized just how happy we were to be in such a stunning paradise. 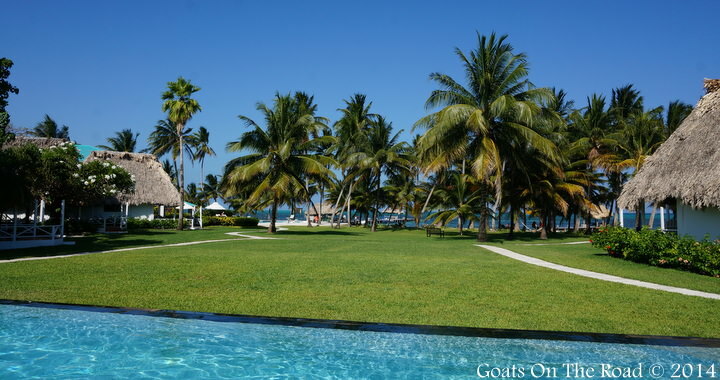 For more beautiful, luxury accommodation in Central America, check out Hotel Scoop. We were picked up at the ferry terminal by a friendly man in a golf cart and we puttered back to Victoria House over the bumpy roads of Ambergris Caye. After about a 10 minute ride, we arrived at the gates and pulled into a beautiful palm-shaded garden. The temperature immediately cooled as we entered the property and we were greeted by a friendly receptionist who showed us to our room. We were shown to our “Plantation Room” which overlooked the pool, the sea and a lush garden of hibiscus and palms. The room was kept comfortably cool for our arrival and there were two, locally made chocolates placed by each pillow on our luxurious 4-poster king-sized bed, which was draped in a hand-made linen canopy. 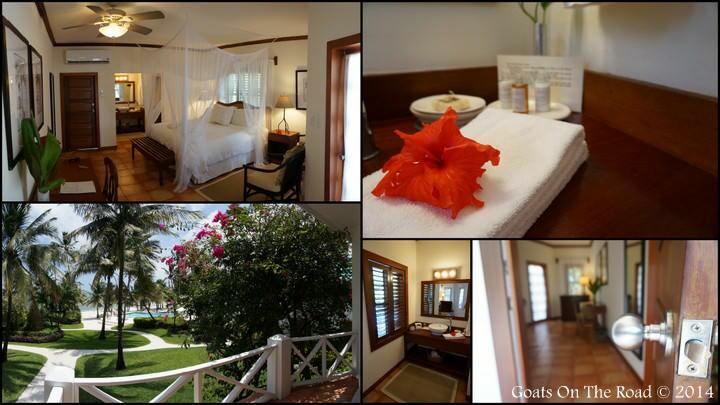 The room itself was tastefully decorated with Belizean hand carved furniture. Using a delightful mixture of mahogany, bamboo and wicker, the suite was perfectly balanced throughout. The bathroom was large and spacious with a rain shower that had an amazing amount of pressure. All of the shampoos, soaps and lotions provided by the resort were made entirely of all natural, local ingredients. Our plantation style room isn’t the only option at Victoria House. In fact there is a dizzying variety of accommodations ranging from simple, yet lovely State Rooms and Casitas to Garden Bungalows and luxurious, 3,500 square foot, beachfront Villas (pictured below). All rooms face either the garden or the sea and none come without the cool afternoon breeze and tasteful, Belizean furnishings. There are two places to eat on the Victoria House Estate. One is the gorgeous Palmilla Restaurant and the other is the waterfront Admiral Nelson Bar. We preferred to lounge at the bar in the afternoons and enjoy delicious, freshly caught seafood for lunch. We paired each meal with a perfectly mixed rum punch to wash it all down. 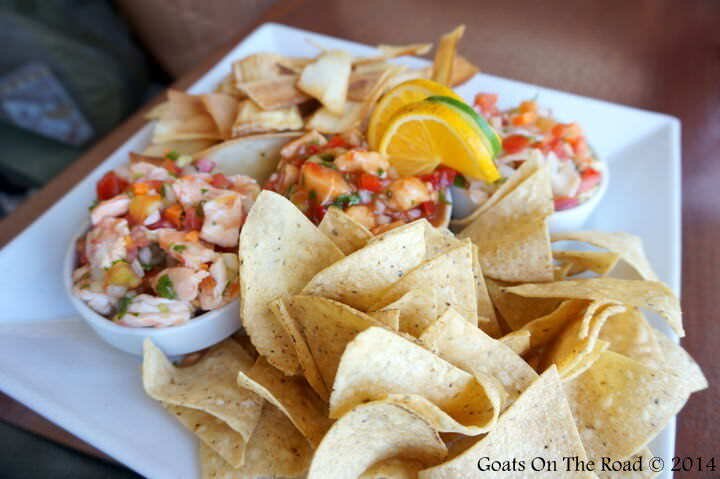 Most of our evenings were spent at the Palmilla Restaurant which had formal service in a refreshingly casual setting. We found the dining room to be a bit stuffy, despite its obvious ocean-side charm, so we often opted for the outside patio seating. There was something about dining under the stars, with the sound of the ocean and the cool wind in our faces that really kept us from wanting to eat anywhere else on the island! As if the ambiance wasn’t enough to keep us here, the food was absolutely superb. I would highly recommend the slow-roasted, barbecue flavoured beef ribs which were so tender, they slid off of the bone. Dariece’s favourite dish was the oven-roasted rosemary chicken, soaked in a wine jus with roast potatoes and green beans. The cuisine on offer at both restaurants was unpretentious, home-cooked and simply divine. This is where Victoria House really excels. The people who work here are incredible. We wonder how they managed to hire such a large number of friendly, capable and caring staff. After we mentioned our room number to the bartender on the first day, he knew us by name for the rest of our stay. Not once did we have to repeat our room number to him or remind him of who we were. The same could be said for the rest of the staff, who all treated us like honoured guests. We would expect a high level of service from an exclusive 5-star resort like Victoria House, but the staff here went truly above and beyond. We were frequently welcomed to the restaurants, pools and beach areas by name, and if we ever requested something to our room, it was promptly delivered with a smile. One of the staff members even offered to take us fishing on his day off just because he enjoys the company of tourists. The staff at Victoria House was a major highlight of our visit. If you can pry yourself away from either of the ocean view pools, Victoria House has a wide variety of activities on offer. Everything from PADI scuba diving to deep-sea fishing can be organized at the activity center located on the Victoria House dock. Free snorkel gear, kayaks and bicycles are also on offer which we took advantage of on numerous occasions. It takes about 10 minutes to ride into town and it’s nice to be able to have full access to the bicycles instead of having to wave down a taxi. If you’re sore after a long day of bike riding, canoeing, diving or fishing, head to the seaside spa for a relaxing massage. There are also golf carts for rent and the resort offers a free pickup and dropoff from the airport or ferry terminal. Even if Victoria House wasn’t located on one of the most dazzling stretches of sand in Belize, the breezy 10 acre property would still be exquisite. The warm afternoons are cooled by the shade of slow-swaying palms and if your room isn’t facing the ocean, it’s looking out at one of the lush and charming gardens. Our plantation room had a massive hibiscus tree growing right in front of our patio where a large iguana often found refuge in the high branches. He would scurry around the tree as we enjoyed our morning coffee and his presence really added to the natural feel of our room. Click Here for a Victoria House Site Map. 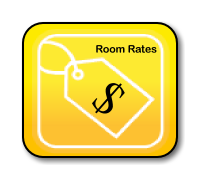 The cost of rooms vary per night from $195 for the State Rooms to $1295 for the Casa Del Sol. Our Plantation room costs $335 and there are a wide variety of different rooms for couples, single travellers and families. Victoria House also offers many different packages which cater to all styles of holiday. For more information on their room rates, and to find the cheapest price for a room at Victoria House, click here. Victoria House is the ultimate example of barefoot luxury, where the service is top-end but the entire place has a casual vibe. The staff and restaurants really set it apart from other resorts in its class and we were constantly amazed by the beautiful beach and tranquil garden property. We strolled up and down the beach for kilometers and from what we saw, Victoria House has the best plot of land on the island. As always, we like to rate the resort with pros and cons for an honest review. Staff – Friendly, genuine and efficient. Pools – Clean and situated right near the sea. The infinity pool looks out over both the garden and the sea while the other pool is just steps from the beach. Rooms – Very stylishly decorated, comfortable and cool. Food – Everything on the menu was delicious and the plating and presentation was 5-star as well. 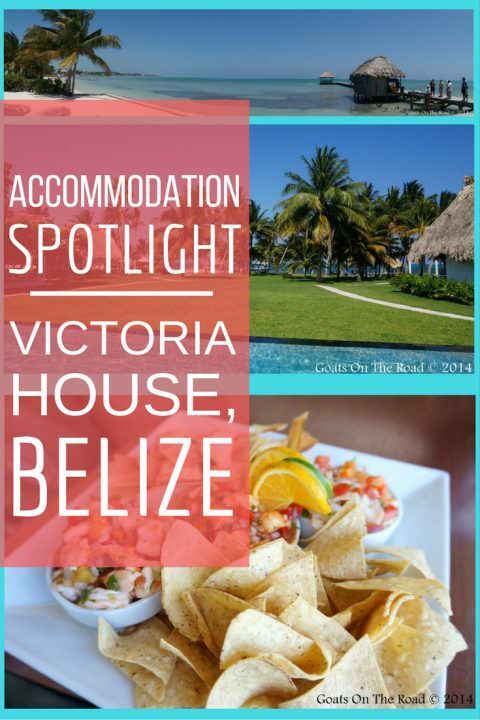 Location – Like most resorts on Ambergris Caye, Victoria House is slightly out-of-town. Luckily, the resort has fixed this problem by offering free bicycle rentals and good rates on golf carts. No Creole Food On The Menu – Despite the fact that we enjoyed the food, we would like to see more Creole inspired dishes on the menu. Some of the specials included locally caught fish, prepared with Creole style spices, but it would be nice to see a better balance of local and continental food. We loved it here for many reasons, but it was the feeling of casual luxury that put Victoria House on another level from other resorts we’ve stayed at. Despite having 42 rooms, the resort felt like a small boutique hotel and wandering barefoot around the gardens, pool and beach seemed almost expected. The intimate atmosphere, delicious food and friendly staff all combined to give us a truly memorable holiday experience and we hope that we can one day return to this wind-swept island paradise. 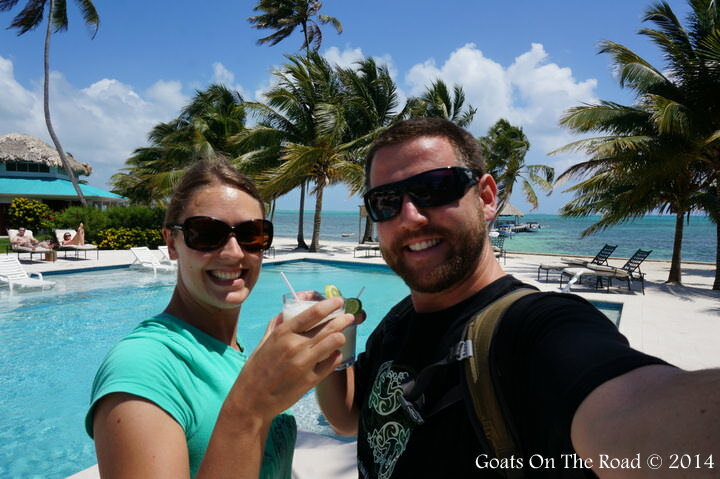 Check Out Our Quick Video Of Victoria House, Belize! Looks beautiful! And how cute, you had a resident iguana right outside your room! I know! It was amazing to have a massive Iguana hanging out in the tree right at our room. Victoria House is the nicest place we’ve stayed, loved it!